Granny Clampett is at it again. 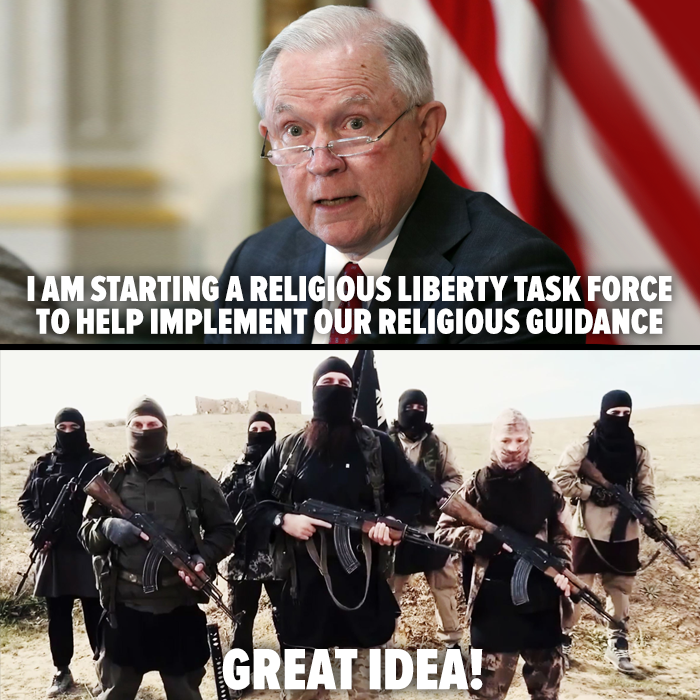 A Religious Liberty Task Force? First off - why? In what world does the Dept of Justice need that for? Yes, the question is rhetorical. Said 'task force' will "enforce a 2017 DOJ memo ordering federal agencies to take the broadest possible interpretation of “religious liberty” when enforcing federal laws." Jeff Sessions characterized the task force as a necessary step in facing down the prevailing forces of secularism. “A dangerous movement, undetected by many, is now challenging and eroding our great tradition of religious freedom which must be confronted and defeated, ” says she. During the announcement of this Sessions specifically mentioned support of bakers refusing service to homos. Good thing that justice is blind, eh? So, as far as I can tell, we are talking - surprise surprise - conservative christian task force. I have heard zero mention of Jews, Black christians, Hindus, Muslims or Jedis. You can dress it up any way you'd like Granny, but we are two steps away from the new Inquisition. You are definitely back from vacation on this one ... but ..
xstain sharia; guess granny never heard of separation of church and state. elimination of all religion would help.